Twitter reported strong sales in its first financial report since going public last year, but the stock fell in after hours trade on a disappointing outlook. The social network reported sales of $243 million in the fourth quarter, up 116% from the same time last year. That easily beat the $218 million in revenue that Wall Street analysts surveyed by Thomson Reuters had forecast. But for the current quarter, Twitter expects sales of between $230 million and $240 million -- double last year's haul but lower than the past quarter. It would mark the first time Twitter's quarter-over-quarter sales have fallen since the company began reporting revenue in 2011. Twitter (TWTR) shares fell 22% Thursday. Twitter reported a net loss of $511 million in the quarter. Twitter has yet to earn a profit. But most of the loss was due to employees cashing out their stock-based compensation. Excluding that and other one-time expenses, Twitter said it earned $10 million - or about 2 cents share. Analysts were expecting a loss of 2 cents a share. Twitter is also facing a slowdown in user growth. 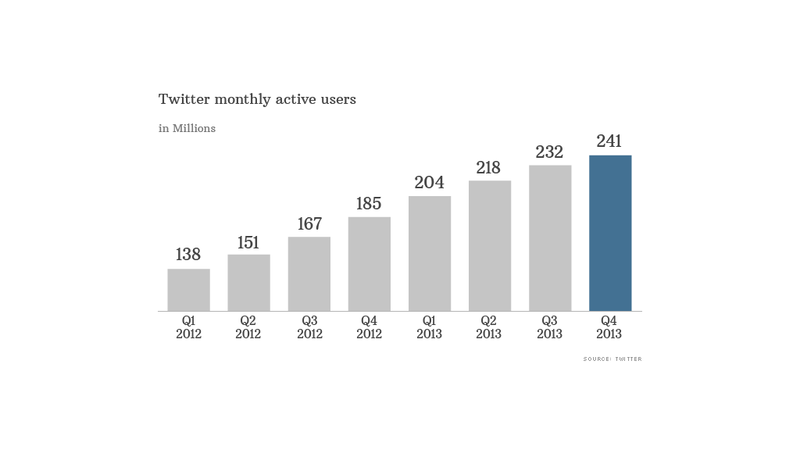 Twitter reported that 241 million people used the site on a monthly basis last quarter. While that's a 30% jump compared to to the same time last year, it's only up 3.9% from the previous quarter. In the four prior quarters, the average quarter-over-quarter growth rate was 7.4%, and in 2012 it was 10.3%. Mobile was a bright spot for Twitter: Mobile users were up 37% year over year, and more than three-quarters of all users access Twitter via mobile devices, roughly the same percentage as the previous quarter. Facebook (FB) has also had success in mobile recently, but it struggled in that area early on. Most of the site's revenue came from advertising -- $220 million this quarter, a jump of 121% from last year. Mobile accounted for 75% of ad sales. Twitter's remaining $23 million in revenue came from data licensing and other sources. This is the first time Twitter has released financial results since the company had its IPO last November, which did quite well. The firm raised nearly $2 billion and saw its stock price surge 73% in its first day of trading. Since then, its stock has also performed well -- gaining another 47% since its close on its first day of trade. Investors like Twitter's perceived ability to one day turn its rapidly growing user base into serious ad dollars. But some have questioned whether such a young company -- especially one that's yet to turn a profit -- should really be worth its current market capitalization of $36 billion -- roughly the same as Kraft Foods (KRFT) or Deere & Co.